We don’t know much about Second Life. We haven’t figured out how to do something worthwhile with our first life, and we’re pretty sure spending more time on line than we already do isn’t the answer. But of course most people have their act together much better than we do, so for them having a second, virtual, life is an option. It’s probably a relief to enter a place away from routines and mundane concerns. Second Life (Wikipedia explanation here) has all kinds of places to go, and people can build things there. So naturally there are Stonehenges. We mentioned a couple when we did a post on virtual Stonehenges before. As far as we know, each one is, in its context, a real Stonehenge, not a replica, although–who knows!–there may be virtual Stonehenge replicas there, too. If you know of any, do not hesitate to let us know! 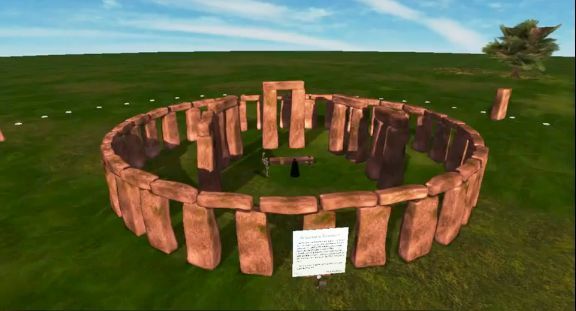 Here’s a link to another, quite accurate Stonehenge made for Second Life. Here’s another Second Life Stonehenge on Flickr. We confess this is all mind boggling to us. We have this strange feeling that all these Stonehenges will have to come to blows someday like male mountain goats vying for the harem. We can see it now, all those huge stones hurling themselves at one another, trying to establish which is the real Stonehenge. When that happens, Second Lifers, get pictures! Who builds these Stonehenges in Second Life? Astronomers? Engineers? Druids? We’d be curious to know. But we’re glad to know that people take the things that inspire and awe them with them wherever they go! A different kind of post today. What better than a 5000-year-old monument, or at least a not very good likeness of it, to demonstrate a state of the art gaming interface? Watch as this young man moves the stones into a circle! If, as some say, our life is not real but virtual, maybe the druids used this method to raise the original on Salisbury Plain, even though they wouldn’t reach England for at least another thousand years. There, people–you saw it here: Ancient mystery solved on Clonehenge! With our April Fool’s Day post out of the way, we arrive at our 150th post. Unremarkable to you, perhaps, but when we started this folly we doubted we would make it to 40 before running out of replicas. Ha! And may we repeat, ha! At any rate, today we would like to address a different kind of Stonehenge replica than usual, the replica in a virtual world. 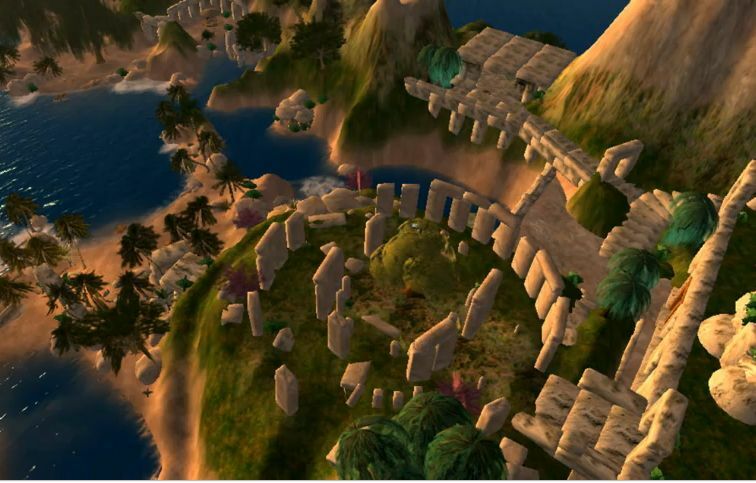 In Second Life, for example, we are told there is a Stonehenge near a castle (thumbnail at left by Jocgart). In other virtual worlds there are other virtual Stonehenges. A game called Hellgate: London had a Stonehenge with a different, darker look as you see in the photo below, from the blog Pumping Irony. Below is another, which may also be from Second Life, photo by Toady. 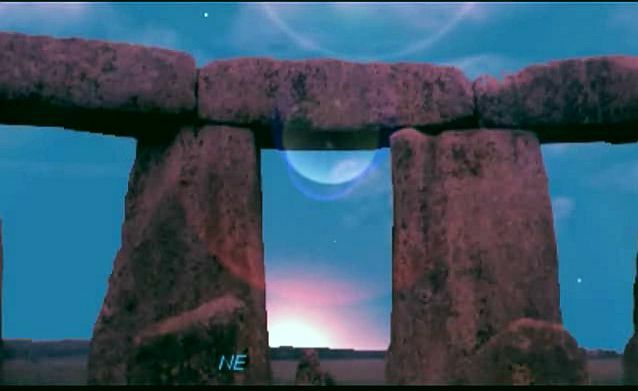 These virtual Stonehenges may capture, even better tha n real life replicas, meanings that Stonehenge has for people, its place in our psyches, individual and collective. Place of magic, place of battle, place of power, place of joy. It seems that as we recreate Stonehenge, we recreate some hidden powerful place in our imaginations, and no world we create can be complete without it!